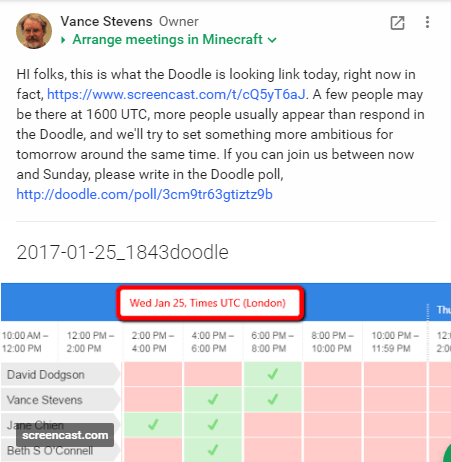 Our Thursday, January 26, 2017 server party was organized around a commitment by David Dodgson aka ELT Sandbox to meet us at his mountain retreat in Minecraft and talk about EVO Minecraft MOOC. In the end we were taken on tours of the mines under the retreat, the mob-spawning tower created by David Plumel, and the village protected by Dakota Redstone so he could have trading partners to supply him with emeralds. David Dodgson was one of our original EVO Minecraft MOOC moderators. The event was attended by Rose Bard, David Dodgson, Linda Gielen, Maha Abdelmoneim, Jeff Kuhn, Jo Kay, David Plumel, Dakota Redstone, Christophe Menard, in addition to myself (and if I left anyone out, let me know, and I’ll rectify the oversight here). We visited David Plumel’s very elaborate mob farm in his castle keep with +Linda Gielen, but we didn’t record it. Meanwhile +Rose Bard invited me to see the mob farm she was making beneath her house. She was using Discord, so we decided to stream the tour, and you can see it here, https://youtu.be/lIhF27OSqBE and in the embed above. Presenters: Peggy George and Kim ThomasIn these times of severe budget cuts and compelling needs for meaningful professional development for teachers, we need high quality, no-cost/low-cost alternatives. They must be flexible and support teachers who are eager to take charge of their own learning in relevant, meaningful ways at times that work for them (“PD on Demand”). Claim your “Super Hero Credit Card” and learn about how to build your PLN through fantastic resources for free, online webinars, virtual conferences, Twitter, Pinterest, Periscope, blogs, Livebinders, and much more. Charge Up Your Super Powers by Charging Up Your PLN!In this webinar Peggy and Kim will share a Livebinder full of resources to help you build your own professional learning network through participation in and collaboration with many free, virtual learning opportunities. Takeaway: access to the entire Livebinder of curated PD resources to fully explore following the session. Kim Thomas is the Technology Integration Specialist in the Madison School District in Phoenix, AZ. For 16 years she has been fortunate enough to be able to follow her passion of working with teachers and students in finding fun and interesting ways to integrate technology. She is also an Organizer for EdCampPhoenix and a STAR Discovery Educator. Prior to this position Kim was a 4th-6th grade teacher in the Glendale Elementary School District. More information and session details are at http://live.classroom20.com. If you’re new to the Classroom 2.0 LIVE! show you might want to spend a few minutes viewing the screencast on the homepage to learn how we use Blackboard Collaborate, and navigate the site. Each show begins at 12pm EST (Time Zone Conversion) and may be accessed in Blackboard Collaborate directly using the following Classroom 2.0 LIVE! link at http://tinyurl.com/cr20live. All webinars are closed captioned. On the Classroom 2.0 LIVE! site (http://live.classroom20.com) you’ll find the recordings and Livebinder from our recent “Imagineering Your Classroom: 21 Disney Projects and Applications to Engage Students” session with Dr. Howie DiBlasi. Click on the Archives and Resources tab. In this session Nik will look at a range of tools and resources to encourage students to look at web based information in a more critical way. To watch the recording of the full session, click here. On Saturday, January 21, 2017, at 1500 UTC, Learning2gether delivered a special treat by streaming an EVO Minecraft MOOC Server Party and Tour from Minecraft in-world using Discord for voice. Tour guides who had indicated they’d be there included Rose Bard, Linda Gielen, Maha Abdelmoneim, Jane Chien, and Vance Stevens. All were welcome to participate in Minecraft live or in the stream, and as all worked well, a recording was created at the YouTube link. Hi, Vance and all – Dennis aka Osna, Germany and Second Life, EduNation. I find, after a lot of time in Second Life, I am much more aware of colour I am in First Life. I’ve also just decorated my study here in Germany and realised after a while that I was nconciously copying colour schemes I had tried out in a villa I have in Second Life. I’ve always thought Second Life was a stupid name. To some people it means death… Where is Second Life if it is not in in First Life. Better, surely, to think of virtual worlds as part of our human world, not an alternative. This is my first time in Minecraft, if that is where we are. I am surprised of comments I have read in the past that people coming into Second Life were disappointed at the way things looked. What I am looking at looks like Lego compared to the look of objects in Second Life. Vance Stevens was invited to give a talk for the EVO Session Techno CLIL on the congruence of that session with EVO Minecraft MOOC, which Vance is co-moderating for the 3rd year in a row. After looking at some of the assumptions of CLIL, Content and Language Integrated Learning, Vance shows how three of these, language competence, learning curricular subjects in a foreign language, and combining teaching strategies and technical tools, are supported in Minecraft. 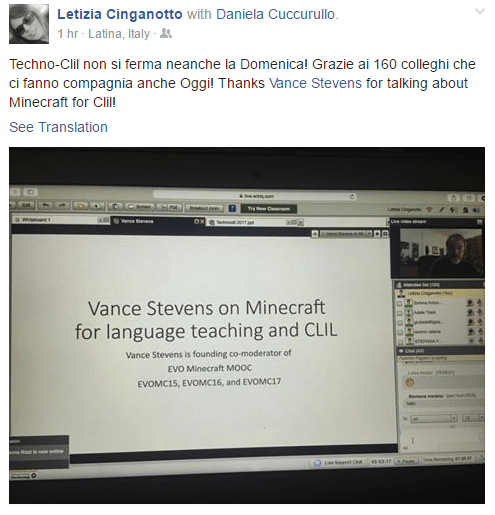 In Vance’s view, one teaching strategy supported by Minecraft with great potential for CLIL is gamification. Vance touches on the MOOC concept and community as curriculum before introducing Gee’s notion of Big G and little g games as one framework for gamification. The little g game is Minecraft, but the big G game is EVO Minecraft MOOC, which was itself designed as a game. Vance explains how the Big G game of EVO Minecraft MOOC was designed and what happens when participants go to the Google+ Community and figure out what to do to play the Big G game, and what they learn by doing so. This is contextualizes what the organizers of this session put in the description they left on WizIQ. 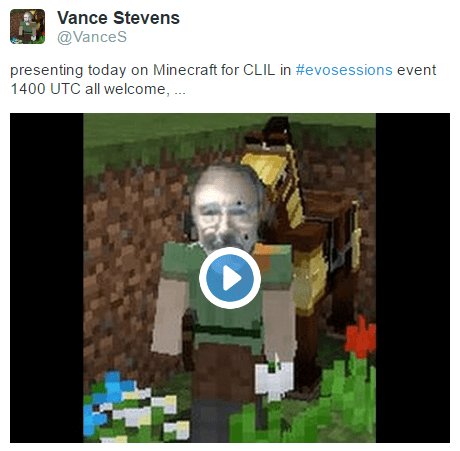 Vance will explore the potential of Minecraft for language teaching and CLIL. We are all learning about gamification here, it’s not so much about Minecraft. Minecraft is the little game, the enabler of our emerging knowledge of gamification. When you enter survival mode you’ll find that you are assisted by others in world. With their help you stay alive and learn. So gamification turns out to be learning through teamwork and mutual support and meeting challenges and achieving your goal, whatever it is. In this game you set your own goals. By achieving your goals in the game light bulbs go off in your head and light your way to some realization of how what you are learning in Minecraft might work to meet your real world challenges. You have to enroll in the EVO session to reach the link below, so I made a Camtasia version and uploaded it to YouTube here, https://youtu.be/VT8vVmMQAhs. It’s the video at the top of this post. But here is the recording in WizIQ as stored in the course. I made a Camtasia version viewable by all because it gives the participant view with participant text chat visible and my web cam prominent, unlike the view I recorded while streaming as I was presenting it, so that people in our networks would be able to tune in live, or play the recording immediately thereafter. Nicky Hockly is Director of Pedagogy of The Consultants-E, an award-winning online training and development organisation. She has worked in the field of English Language Teaching since 1987, is an international plenary speaker, and gives workshops and training courses for teachers all over the world. 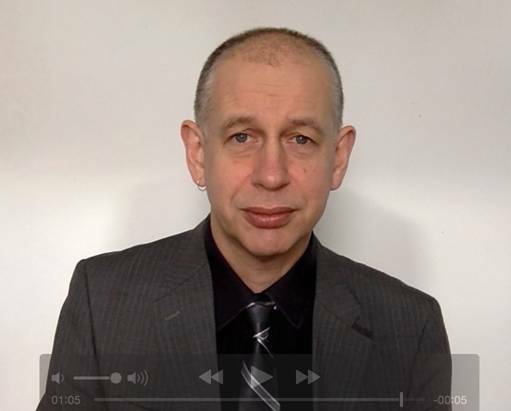 Nicky writes regular columns on technology for teachers in ETP (English Teaching Professional) magazine, and in the ELTJ (English Language Teaching Journal). 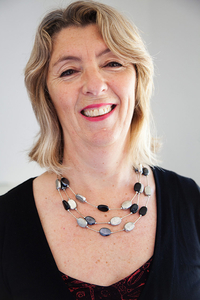 She has also written several prize-winning methodology books about new technologies in language teaching, many of them with co-author Gavin Dudeney. The latest of these books are Focus on Learning Technologies (2016), and ETpedia Technology (forthcoming 2017). She is a member of the Oxford University Press ELT Expert Advisory Panel, a Consultant for the Cambridge English Teacher platform (Cambridge University Press), and is a member of the NILE Advisory Panel, as well as being a member of the TESOL Journal Advisory Board. Nicky lives in Barcelona, and is a technophobe turned technophile. You can find out more about Nicky on The Consultants-E website here, including a complete list of her publications. Elizabeth Anne and José Antônio give participants a tour on the many ways PBworks and other wikis can be used in class with students and with peer teachers to share and collaborate. They will showcase practical examples of projects carried out using this tool. 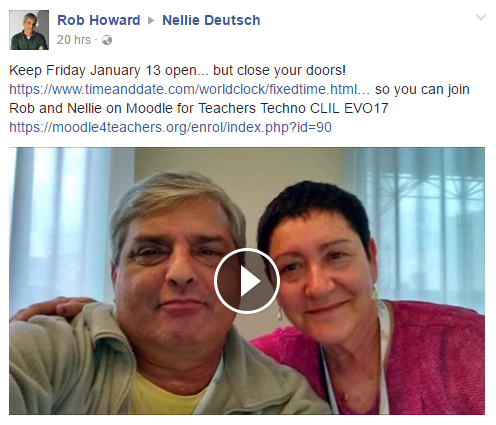 On Saturday, Jan 7, 2017, Electronic Village Online celebrated the Kickoff Webcast marking the 16th iteration of the ever-popular EVO (free online professional development sessions for English language educators everywhere) with Vance Stevens, lead coordinator Mbarek Akaddar, past lead coordinator Nina Liakos, and Nellie Deutsch acting as show hosts, and featuring members of the Coordination Team and moderators from this year’s 16 sessions. Happy New Year! We are energized and excited to return after our winter break with our Annual Anniversary Celebration. In this first webinar of the New Year we will be celebrating our 8th Anniversary on Classroom 2.0 LIVE as well as holding an Open Mic show on a topic all of us will surely have something we can share! “Back to the Future Classroom 2.0 Style” Which tools were you using in 2009 when Classroom 2.0 LIVE first began? What has changed? How do we do these things today? What is obsolete, what’s on the horizon? Share tools, apps, stories, examples, questions. We chose this topic because we felt it was broad enough to include everyone! Join us, take the mic and share your memories, tools, apps, stories, examples, questions and advice. <ahref=”https://twitter.com/plnaugle“>Paula Naugle will facilitate the conversation and we hope you’ll come prepared to share with your headset/earbuds on to take the mic and add to the conversation. We’ll have an awesome Livebinder prepared with resources and will look forward to adding your resources to the Livebinder. More information and session details are at http://live.classroom20.com. If you’re new to the Classroom 2.0 LIVE! show you might want to spend a few minutes viewing the screencast on the homepage to learn how we use Blackboard Collaborate, and navigate the site. Each show begins at 12pm EST(Time Zone Conversion) and may be accessed in Blackboard Collaborate directly using the following Classroom 2.0 LIVE! link at http://tinyurl.com/cr20live. All webinars are closed captioned. On the Classroom 2.0 LIVE! site (http://live.classroom20.com) you’ll find the recordings and Livebinder from our recent “Valerie Lewis: Featured Teacher” session with Valerie Lewis. Click on the Archives and Resources tab.